An early 20thc mahogany commode in the Classical style of fine quality, influenced by Robert Adam. The top is solid mahogany & underneath this is a shaped carved moulding with roundel decoration. 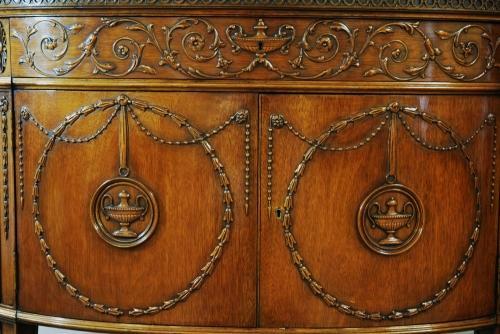 The cental area consists of a frieze drawer (mahogany lined) & finely carved scrolling acanthus decoration with a clasiscal urn in the centre which forms the escutcheon. Underneath this are two curved doors, each decorated with a central medallion framing a classical urn, suspended by a ribbon decoration. This is supported by a large medallion of bell flowers & at the top of this is a draped ball bead carving in the form of a swag, supported by flower head pateras. At the edge of these doors is a carved husk decoration in a recessed panel suspended from a flower decoration at the top. The curved ends have a fluted frieze decoration with oval pateras. Underneath this the doors have decoration as before other than the central medallion has a stylised flower design, again suspended by a ribbon decoration. The piece is supported on four tapered & recessed legs, each having ball carved moulding terminating in a block foot.